September Mourning, Vol. 1 recollects the Kickstarter first comic for the regular market on the heels of the band's upcoming tour across the U.S. The group will be setting up intimate acoustic shows and signings at comic shops while they're on tour. “We want to create an inviting and welcoming universe,” exclaims September. “When you listen to us, you’re transported to another realm and become a part of the story.” That story unfolds over the course of Volume II. Produced by Sahaj Ticotin [SEVENDUST, ILL NINO] and Howard Benson [MY CHEMICAL ROMANCE, SKILLET] and recorded throughout 2015, the album’s twelve tracks weave together a nail-biting narrative that follows September as she “swaps souls” and defies Fate. Dialogue from the graphic novel punctuates the rapturous union of robust guitars, sweeping orchestral electronics, and her hypnotic and hard-hitting delivery. Picture Marilyn Manson-size theatrics, gorgeous heaviness a la Muse, and a big screen-worthy scope for a snapshot of what’s to come. The single “20 Below” begins with a rallying chant, percussive handclaps, and booming drums before her voice enchants with a siren’s swell. 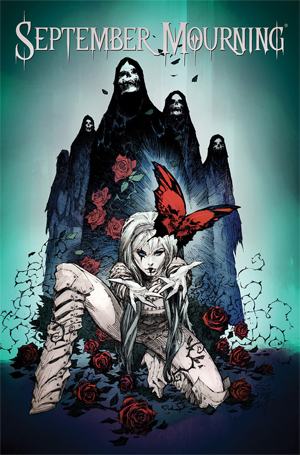 As a result of this honesty, SEPTEMBER MOURNING continues to attract fans to its legion of supporters fondly dubbed, “The Children of Fate.” That army helped fund a successful Kickstarter campaign to launch the graphic novel and religiously follows the band. The message in Volume II benefits “The Children of Fate” the most.